Dimensions 3" tall X 2" wide. 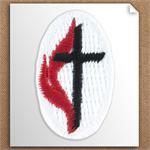 Beautifully embroidered oval shaped patch with the United Methodist Cross and Flame logo. 100% embroidery coverage on this patch. Very clean laser cut edge. 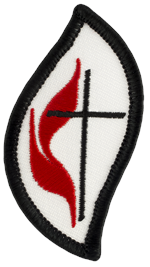 United Methodist Women UMW Patch. Dimensions 2.5" tall X 1.3" wide. 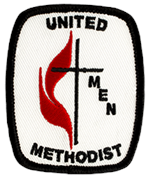 United Methodist Men UMM Patch. Dimensions 2.5" tall X 2.1" wide. 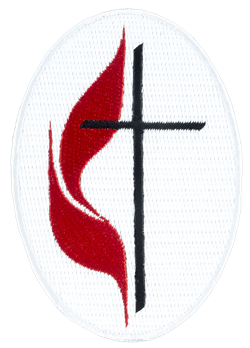 United Methodist Church Large Patch. Dimensions 5.4" tall X 3.6" wide. 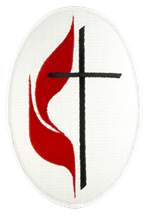 United Methodist Church 3" Self-Stick Applique. Dimensions 3" tall X 2" wide.